Welcome to Cortez Sportfishing, one of San Diego's finest fishing charter vessels with an unsurpassed record of catching fish. 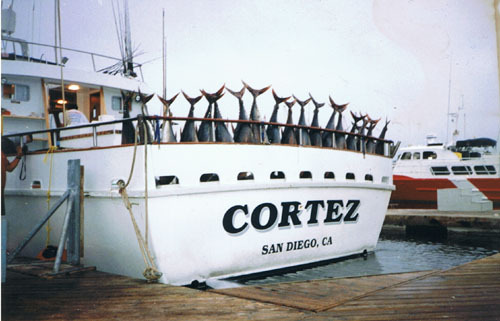 The Cortez is a 65 foot sport fishing vessel specializing in both open party and private sport fishing charters from Southern California to Baja Mexico. The Cortez comfortably accommodates groups of up to 23 passengers on overnight and multi-day fishing trips, and up to 43 passengers on local 1/2 day, 3/4 day, and full day trips. On offshore fishing trips, the Cortez targets fish species such as yellowfin tuna, bluefin tuna, albacore tuna, bigeye tuna, yellowtail, dorado, and more. On the local day trips, the Cortez targets a variety of San Diego's local fish species such as bass, white sea bass, barracuda, yellowtail, bonito, rockfish, and more. The Cortez is also available for open party and private whale watching excursions as well as any custom charters. Owner/Operator Jim Hughes has over 35 years of experience fishing in the San Diego sport fishing industry and holds a well-earned reputation for catching fish. Jim Hughes and the crew of the Cortez dedicate themselves to providing exceptional customer service and comfortable accommodations while working hard to ensure that each fishing trip is both enjoyable and productive. Join our Mailing List for upcoming deals and up to the minute fishing news. Departure: Return: Trip Type: Description: Cost: Avail. Spaces Book Now! Experience San Diego Fishing, Offshore Tuna Fishing, and Deep Sea Fishing Charters at Their Best!